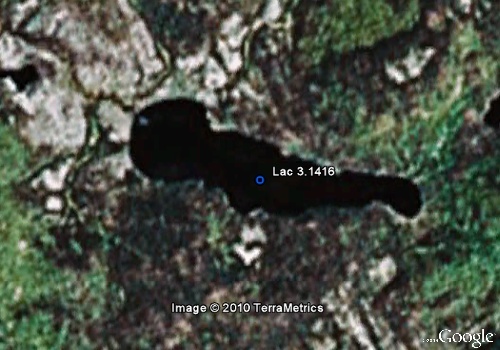 Believe it or not there is a lake in Quebec Canada, named Lac (lake) 3.1416 - the value of the universal mathematical constant Π (Pi). Because of unique topography, Canada has a multiplicity of lakes and many of these have been named after geometrical shapes. In Quebec alone there are 140 lakes having name as Round, 52 as Square, 21 as Triangle, 12 as Oval, 3 as Rectangle and 2 as Hexagon. However the most unique and unusual name is 3.1416. The reason for this strange name is also almost unbelievable. Reportedly 3 friends had built a fishing camp there measuring 14x16 feet which earned it the official name of 3.1416, which co-incidentally is the value of Π (Pi).